(Nov 26, 2015) - - ARES has been evolving to meet the needs of our served agencies. Agencies and the volunteers are better organized than ever, and are required to be better trained in technology, tactics, and organization. Volunteer organizations must be self-sufficient rather than rely on their served agencies to provide them support. The Ohio Section is working to ensure that ARES remains a viable and vital partner in emergency communications to our served agencies and a partner in managing public events in our communities. In 2016, you will see several important changes throughout the Ohio Section. 1. More rigorous training. Building and maintaining essential skills and qualifications is a priority. These need to cover radio technology and tactics, organization, and relevant regulatory concerns. We’ll continue putting these to work in the kind of multiagency exercises that many ARES groups throughout the Ohio Section have been supporting in recent years, showing the agencies just how we can support them. 2. Greater capability. Our system of providing support to local ECs through Districts and with ARESMAT will help to ensure our agencies that should the time come, trained and capable operators will be available. The OARS database helps us to identify and to organize assets needed to respond. Team W8SGT keeps the State EOC on our airwaves. Exercises in using NVIS, mesh, fldigi , and other technologies have proved successful, giving us more options than ever to move voice, text, images, and video all without others’ infrastructure. 3. Greater service to our agencies. As our skills and capabilities increase, our focus is still on making ARES a working partner with our agencies. We have the capability to become a ‘technical advisor’ to our agencies. We should always display the attitude that we’re there to help- whether that be via ham radio, our first priority, or in any other was that we can. With our own support systems, field operations capabilities and infrastructure such as repeaters we can ensure our served agencies and public events coordinators that we have the resources to support them. The Ohio Section leadership is excited about 2016, and are looking forward to working with all Ohio Section ARES volunteers to realize the vision of a fully-capable Amateur Radio Emergency Service throughout Ohio. My great thanks and appreciation to all of you for your enthusiasm and dedication! (Oct 18, 2014) - - Massillon City officials have initiated an incident command system (ICS) as a precautionary measure in the event of a local emergency relating to Ebola. ICS is a military-style command structure used to coordinate response to emergencies and has been part of the Stark County ARES training for many years. Massillon City Health Commissioner Terri Argent noted that the agency is ramping up and maintaining communications daily with city safety forces in order to be able to respond quickly if an emergency occurs. City Safety-Service Director Al Hennon, Fire Chief Tom Burgasser and Argent meet daily to discuss the status of this issue and how it might relate to the city. The Canton City Health Department has also implemented a similar response system in the event of an emergency. Stark County ARES maintains communications with our County EMA office and would be ready if called upon to provide support communications to area hospitals, health departments and the EOC if needed. (Feb 2, 2014) - - An equipment or "Go-Box" is quickly becoming an essential part of every radio amateur involved in public service communications. More and more, amateurs are being tasked to quick deploy to everything from local public service drills to disaster scenes. Equipment Boxes have been showcased at several Ohio Section ARES meetings and I have posted several of my designs on this website the past year. I have received a few emails asking for more information on the topic and have added some additional information on the Projects Page of this website. Additional pictures of several of my own designs are included as well as a link to many shown during the past Ohio Section ARES meetings. If any of you have built your own versions we would be happy to include them on the page. Send me a short recap of your design with pictures if you have them and I will post them. A portable Go-Box can be a great project and very useful when you need additional capability during an ARES event. Click Here for a direct link to our Project Page. 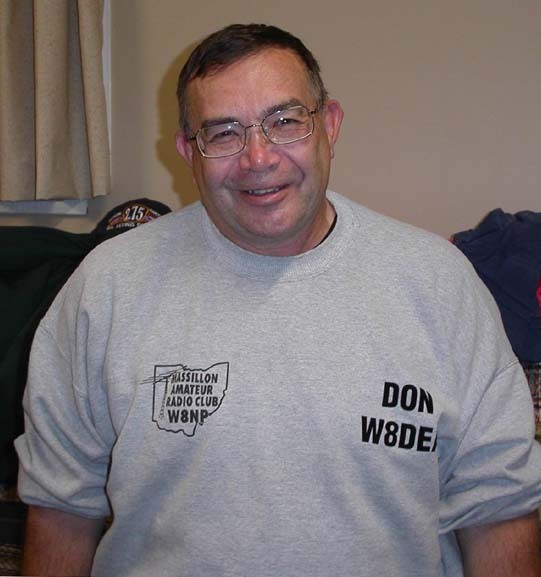 (Jan 20, 2014) - - The Massillon Amateur Radio Club recognized club member Don Wade, W8DEA with their annual Public Service Award for 2013 during their annual Awards Banquet on Saturday, January 11th. Don is also part of Stark Co ARES as an Assistant EC in charge of our training program. A past recipient of this award, Don again demonstrated his commitment to our community and the Amateur Radio Service during 2013 on assignment throughout the country with FEMA working in the aftermath of several major disasters providing support to victims at relief centers. Once this mission was finished, often requiring several months or more away from home, Don returned to Stark County to resume serving his club and the ARES. Congratulations to Don for this well deserved recognition ! MARC President Mike Sciarini, WA8MKH presents Don (R) with his Public Service Award. 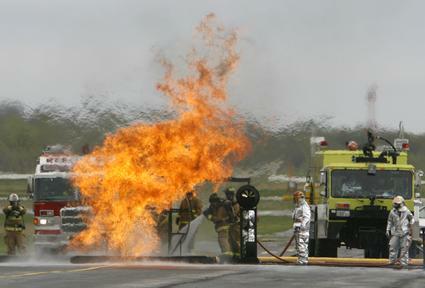 (May 5, 2012) --- Stark County ARES participated in a full-scale airport disaster drill at the Akron-Canton Airport last Wednesday that involved more than 50 area emergency responders. The scenario involved a cargo plane colliding with a passenger plane over Stark County. Debris from the make-believe crash was scattered in multiple locations throughout the area. The participants in the drill included FBI agents, airport security, multiple area police & fire departments and Stark Co ARES. ARES responded to the Stark Co EMA office to activate our emergency response plan that included operators at the EOC and establish an emergency net in case additional operators would be needed. Three members of the Stark ARES including Assistant EC Terry Russ, N8ATZ; Wade Huthmacher, WD8MIU and Don Wade, W8DEA activated our 2 meter station and established an emergency net on the 147.12 Repeater. Check-ins were taken on the repeater to solicit volunteers in case we were needed to support response and relief operations including establishing evacuation centers. We were also requested to monitor county drill communications for any traffic to the EOC for Director Tim Warstler. ARES members have the responsibility to use county communications equipment to support all drill operations. During the drill approximately 20 operators responded to our request for assistance. This was done via the county emergency repeater on 147.12 and the Massillon ARC 147.18 Repeater. The Alliance ARC also stood by with several operators. The drill concluded at approximately 1:00 PM. Director Tim Warstler appreciated our assistance during this annual drill. Participation in these area drills provides us with important experience and the interaction with area support agencies that would be necessary in the event of an actual emergency. The EOC Operations Room converted to manage the Airport Drill. Multiple agency representatives coordinate drill operations. Firefighters practice response operations at the Akron-Canton Airport drill. (Nov 14, 2012) --- The following story recently appeared in the Columbus Dispatch newspaper and is reprinted by permission. Herbert V. Akerberg, believed to be the first person to use amateur radio in a disaster, died on Nov. 6, 1964, in Scottsdale, Ariz.
During the March 1913 flood in Columbus — a catastrophe that killed nearly 100 people — Akerberg was a 15-year-old Hilltop resident. He used his home radio transmitter — the second established in Columbus — to send SOS calls. During the flood, the Scioto River raged through Downtown, taking out bridges, inundating Franklinton and isolating the Hilltop by sweeping away telephone and telegraph lines. In his 1925 History of Ohio, C. B. Galbreath wrote: “For about three days and nights, practically continuously for seventy-two hours, young Akerberg remained on duty at his radio set, in communication with the radio station on top of the Huntington Bank Building, sending messages to the mayor and keeping the public advised as to the conditions on the devastated West Side. “Many messages were sent to the friends and relatives of those in the devastated district. As an adult, Akerberg served with the Army Signal Corps in World War I and directed the building of Avery & Loeb Electric Co.’s WPAL Columbus radio station in 1923. In 1929, he joined the fledgling Columbia Broadcasting System and helped build out its radio and television networks. Times have changed, but amateur radio thrives in Columbus. The city is home to more than 1,500 licensed ham radio operators. (Jan 26, 2013) -- January 26, 1978 started off as a typical winter day here in northeast Ohio when snow began falling. By the time the storm had passed, nearly 38 inches of snow had fallen on Stark County. As we approach the 35th anniversary of the now famous blizzard of 1978, take a minute and read about the worst snow storm to ever hit Ohio and the role local amateur radio operators played in this event. Any while you're at it, have a look outside - it's snowing again !. Click Here to read the full story. (Feb 19, 2011) -- Somehow it makes little sense that amateur “ham” radio continues to thrive in the age of Twitter, Facebook and iPhones. Yet the century-old communications technology — which demands such commitment that you must generally pass an exam to receive a license — currently attracts around 350,000 practitioners in Europe, and a further 700,000 in the United States, some 60 per cent more than 30 years ago. (May 31, 2010) -- The ARES forum at the Dayton Hamvention covered multiple topics during its short one hour session. Moderated by Ohio Section Emergency Coordinator Jack Sovik, KB8WPZ, the first topic covered was the Branding of ARES presented by the ARRL’s Media and Public Relations Manager Allen Pitts – W1AGP. Webster defines “Branding” as the identity of a specific product, service or business. A Brand can take many forms including a name, sign or slogan. The word BRAND has continued to evolve to encompass identity – in effect the personality of a product, company or service. So how does this apply to ARES ? The League believes the time has come to set tighter standards for the public service work provided by amateurs in both general appearance and training. This is why the League is updating it’s Emergency Certifications program. The Level 1 program is currently being updated with new material and will continue to remain the Introductory Course covering Public Service communications. It is designed to provide the basic information needed to participate in ham radio public service and emcomm activities. The newly redesigned Advanced Course which takes the place of the old Level 2 & 3 Course has been designed with an extensive prerequisite list covering multiple FEMA courses and is intended for the amateur operators who desire a role in Leadership to support public service activities and Emcomm communications. Appearance has also become an issue with the League. No longer is it acceptable practice when we see communications volunteers in their tie died T-Shirts, shorts and flip flops. This is why the League has introduced the OSHA approved lime green Emergency Communications Vests that is intended to be worn during all ARES public service activities. So why this sudden change in ARES structure ? ARES does a lot of great public service work but because but because it seldom gets much if any media coverage to the public it never gets noticed or recognized. We got positive coverage during Katrina because amateurs spoke up and talked to the media. Most of the time hams are busy behind the scenes doing our work but it isn’t covered by the local media. Many times it is because we are not visible enough during our public service activities. We need to be seen but only as long as it is in the best image. That is where Branding comes in. We need to present a uniform image during our activities just as professional public safety forces do. It is with this concept in mind that it is strongly suggested that all local ARES groups have a ARRL Public Information Officer as part of their team, to make sure the right message gets through to the public. Lastly we must continue to gain any and all training we can through all sources, the ARRL, Red Cross, FEMA and any local training available through the local Emergency Operations Centers. This type is especially important as these are the primary agencies we normally serve. The Forum then introduced the League’s new Emergency Preparedness and Response Manager Mike Corey – W5MPC who introduced himself and his experience in our hobby and public service communications. Mike also believes that ARES is a ground’s up organization. It’s about what happens at the local level that makes all the difference. Continued training is also essential to what we do. 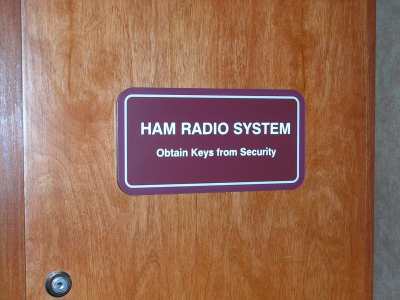 We already know how to talk on the radio, it’s training that separates us from other hams. Mike also announced that 2010 marks the 75th Anniversary of the ARES and the League is planning some special events to commerate this milestone and raise public awareness in the ARES. The final segment of the Forum was a short segment on the recently released new MOU between the National American Red Cross and the ARRL. This has been reviewed before but the wording of the newly revised MOU clarifies the type of Background Check needed and that a volunteer can get their own background check from a police department that does not include a Financial Responsibility check which had been a problem for many would be volunteers. (Feb 4, 2010) -- The ARRL Board of Directors has approved a new Memorandum of Understanding between the American Red Cross and ARRL. The new MOU is the result of lengthy negotiations between the two organizations. Being discussed was a Red Cross requirement that Amateur Radio operators who wished to serve as volunteer communicators agree to have an extensive background check performed. The new MOU allows for amateurs to avoid agreeing to such checking. The new MOU includes an agreement by RC to accept the results of criminal background checks performed by State or local law enforcement agencies as well as checks performed by Mybackgroundcheck.com. volunteer was required to sign. not to be a volunteer. This goal has been accomplished. Hams considering becoming RC volunteers now have the full range of choice. RC agreement to accept criminal background checks performed by law enforcement agencies came with one provision. This is that any fee for having the check done will not be paid by RC. The fee will need to be paid by some other agency or by the individual volunteer. This should pose no problem in situations in which criminal background checks are performed on behalf of EMA or other civil agency with which the amateur is a volunteer. Amateur Radio volunteers my have the checking done by a State or local police agency. Following this process, the volunteer will be required to pay for having the checking performed provided the fee is not already covered by EMA or some other agency. It was refreshing to have RC change its initial position and to agree to accept criminal background checks performed by duly constituted civil agencies. (Dec 1, 2009) -- In December Stark County ARES will celebrate 30 years affiliation with Mercy Medical Center. The picture at the right first appeared in the December issue of Mercy Medical Center's original newsletter called "The View". It shows EC Dave Beltz, WD8AYE pointing to the newly installed antenna on the 10th floor for the repeater. Joining Dave was then R.N. Ruth Kohl of Mercy Safety Committee; Ed Alexsonshk, Supervisor, Safety and Security and Ed Heath, Meteorologist in Charge of the National Weather Service Office at the Akron Canton Airport. The newsletter also included the following story reprinted below. Our continuing thanks to Mercy Medical Center for their continuing support of the Amateur Radio Emergency Service over these many years. A new radio repeater will soon be installed on the eleventh floor of TMMC by the Stark County Amateur Radio Emergency Services (ARES). The repeater system will provide early warning capabilities to the Medical Center in the event of severe weather conditions or other emergency situations. ARES will use the repeater to receive and transmit up-to-date weather conditions to the National Weather Service (NWS) as part of the nationwide Skywarn System. According to Douglas B. West, Director, Safety and Security, TMMC is the second highest point in the county and is only 1/2 mile from the center of the county, which makes it an optimal location for the repeater. The repeater will be operated by ARES, in conjunction with TM's Safety and Security personnel. During severe weather conditions, ARES will provide a professional spotter trained by the NWS who will monitor approaching severe weather conditions from the eleventh floor and report directly to the NWS office at the Akron/Canton Airport through the repeater. According to David Beltz, ARES Coordinator in Stark County, the repeater will allow TM to listen to reports from at least 15 other counties, which will give a more precise update on threatening conditions. Presently, the Medical Center depends on weather data received from the NWS Radio. The data is supplied to NWS by ARES Spotters and is received by the Medical Center about 5 to 7 minutes after it is received by NWS. With the repeater at TM, the Medical Center will get the information at the same time it is transmitted to NWS. This extra 5 to 7 minutes of time will be a great benefit to the Safety and Security Department in Making a decision to go into a Condition Blue, Phase II. It will also help prevent premature Phase II announcements. In addition to the severe weather emergencies, ARES will also provide the Medical Center with communications assistance during disasters, snow emergencies, power and telephone failures, or other emergency situations. (Jun 15, 2009) -- The summer meeting of the Stark Co ARES was held at the County Emergency Operations Center on Thursday, June 11th with 16 members and guests in attendance. 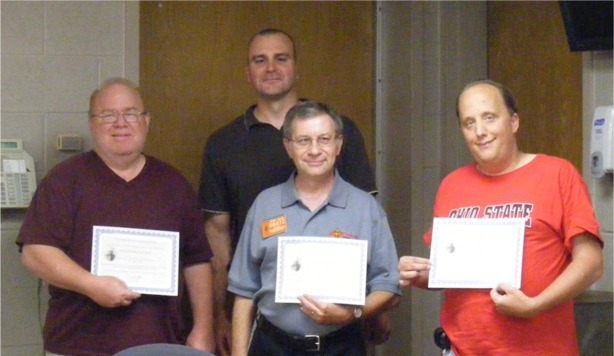 Richard Webber, Deputy Director of the Stark County EMA was also in attendance who thanked Stark Co ARES for our participation in the April 29th Akron-Canton Airport Disaster Drill and also distributed Certificates of Appreciation to the three volunteers in attendance at the meeting. The remaining Certificates will be mailed to the drill volunteers not in attendance at the meeting. The remainder of the meeting covered recent ARES news and events including a short recap of the ARES presentation to the Alliance Amateur Radio Club, a reminder that the start of the severe weather season is right around the corner. ARRL Field Day will be the weekend of June 27-28 and is a great opportunity to practice emergency communications preparation. The remaining time was spent reviewing the upcoming Pro Football Hall of Fame Festival, the largest public service event handled by the Stark Co ARES. Additional volunteers are needed for the Timken Grand Parade on Saturday, August 8th. Contact Parade Communications Coordinator Wade Huthmacher, WD8MIU at (330) 484 - 4496 if you can assist with this important public service event. 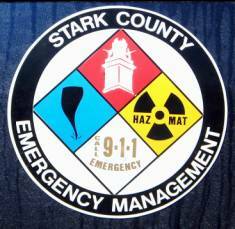 (Jun 14, 2008) -- The Stark County ARES held their second quarter meeting last Thursday, June 12th at the Stark County Emergency Operations Center. The following is recap of the items covered at the meeting. 1.) Request from Tim Warstler for volunteers to staff the EOC during emergencies to operate the county radio equipment. No additional information other than I have received some requests for additional information. Probably put off until this fall. 2.) Winlink Update. Nothing new to report. All nodes are operational using the latest software available. System is very reliable with improved speed using the new software. 3.) Skywarn Spotter Class in March was well attended with over 100 in attendance. Next years class has not yet been scheduled but should be on the 3rd Wednesday in March. 4.) Monthly ARES Reports are currently being submitted to our District EC Jack Sovik. Thanks to routine reports from Michelle and Mike, the reports now include chack in participation from the weeklt ARES net, a nice addition to the report. Thanks to Michelle for providing me with the reports. 5.) ARRL SET in October. So far no progress has been made in setting up a special communications plan for this years event. I still hope to have Stark County ARES participate in some way this year. The weekend of October 4 & 5, 2008. 6.) ARES Registration. So far only 16 registrations have been received. Our original list had 56 registrations, many of which are no longer active. I would rather have fewer active participants than just a lot of names on a list. As the year progresses, I would like to continue to update this list. This will involve contacting those on the original list to update their registration information to make sure they still want to participate in the ARES program. If you have watched the news over the past several months, you know that some extremely severe weather has struck many parts of the country causing incredible damage and loss of life. Since March of this year over 11 states experienced severe weather causing over 60 fatalities and over 1,000 injuries. During most of these situations ham radio operators were actively involved in providing support communications in both ARES and Skywarn operations. So far this year we have been very fortunate with no severe weather occurring in Stark County but our season is usually in the late June, July and August and even into September. When severe weather does strike remember your Skywarn Spotter training, stay tuned to the 147.12 repeater for weather net activation. It’s important to pay attention to what is going on which means more listening than talking. Relay severe weather reports over the repeater and we will relay via the District net the necessary reports to Cleveland Weather. Report from the Dayton Hamvention ARES Meeting. Guest speaker was Dennis Dura, K2DCD the ARRL Emergency Preparedness and Response Manager. Ham Aid - This is the league program which maintains communications equipment for use in the field is being equipped with new equipment to support digital type communications. Emergency Communications Course news.. A new course is being developed covering Digital Modes used in Emergency Communications. Due out later this year. Speaking of the EmComm courses, it was announced that all of the study guides are being reprinted in June to align with updates recently made to the Em Comm Certification Exams. Identification and Credentialing. What is the difference between the two. The ARES name badges that many of us have are strickly ID badges. The simply say who you are and normally identify the volunteer group you are affiliated with. Credentialing is done by a local, state or governmental body. This is the problem that arises during emergencies. Public Safety forces look for proper credentials to gain access to a disaster scene, not a simple ID card. The league realizes this is a nationwide problem with no easy answer and will continue to be a stumbling block for amateurs involved in disaster type communications. The integration of emergency communications groups and organizations. Currently all groups experience infighting because each group wants to retain their own identity. We have even experienced it locally between CB clubs and our own ARES. All groups must learn to get along if we are to remain an effective resource to the community. The question is how do we accomplish this ? League Website Update … The league will soon be updating its website with a new look. As part of this update, there will be a single portal created to emergency communications. The intent is to have a single area where all emergency communications information is available eliminating the need to navigate the entire league website to obtain this information. Dennis also touched on the topic of the league sponsoring spontaneous drills and other planned exercises. This may also include reorganizing the SET drill normally held in October. They may expand the SET to become a more regional exercise. As part of this item the league believes Field Day may have become to much a contest for the purpose of creating high scores. To that end they may look into promoting it back to a National Communications Exercise which is what they originally wanted back in the early days. In doing so, they may even restructure the entire event sometime in the future. ARES Membership - At present there are no specific requirements necessary to be a volunteer communicator in ARES except a desire to become a volunteer. The league believes that some type of Nationwide Standards need to be developed and minimum competencies need to be identified to become a volunteer in the ARES program. This may include completing one or more of the league’s existing Emergency Communications Certifications or other as yet other requirements. Their was some discussion on several of the items covered. The meeting concluded at 9:00 PM setting a date of Thursday, September 11, 2008 for our next meeting probably at the County EOC. (Feb 2, 2008) -- A recent story on the ARRL website covered the important part that ARRL Volunteer Examiner Service plays in the continuation of the Amateur Radio Service. The ARRL/VEC processes more than 70% of the applications for new and upgraded FCC Licenses. We need this influx of new and renewed radio operators if we are to remain prepared to serve our community. As a radio spectrum occupant that pays its "rent" by serving the public interest, Amateur Radio has public service obligations. There are few places in the country where there are enough trained amateurs available to do everything we could and should be doing. We need more among us who are willing to equip themselves with new digital, as well as traditional, communications tools to meet the needs of the disaster response agencies we serve; who are willing to learn and to practice; and who will respond when called. It is encouraging that new licensees frequently cite an interest in public service and emergency communications as their principal reason for wanting to become radio amateurs. An Amateur Radio license doesn't automatically make its holder a skilled communicator, but it's a good start. We all have a responsibility in the training of new radio operators to serve our community. (Nov 5, 2007) -- Thanks to Stark Co ARES member Charlie Scherger, KB8STV for sending us the following link to a terrific old movie clip from MGM Studios. This vintage movie clip in a 1940's (?) newsreel fashion tells of early ham radio public service and is courtesy of YouTube and is a Pete Smith Speciality film. Click on this link, sit back and enjoy ! (Jan 23, 2008) -- Congratulations to ARES member Wade Huthmacher - WD8MIU recipient of this years MARC Public Service Award. Each year, the club recognizes members contributions in several areas, one being Public Service Communications. The continued existence of our hobby is due in part to the volunteer efforts of radio operators across the country who provide communications support to their communities. This years Public Service Award recipient is a fine example of this commitment. Wades' name routinely shows when volunteers are needed for the many events we are involved in. A strong and disciplined communicator, Wade also maintains an impressive training resume and has taken a lead role in the Pro Football Hall of Fame Festival Communications Committee and remains a great asset to the Stark County ARES Program. 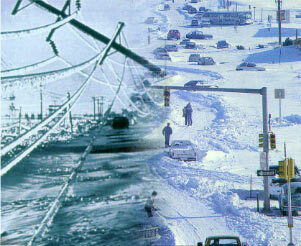 (Jan 26, 2008) -- The worst winter storm in Ohio history struck before dawn on Thursday, January 26, 1978. The Blizzard of ’78 continued through Thursday and into Friday. Transportation, business, industry, and schools were closed statewide for two days with the normal pace of society not returning to the state for five days. Atmospheric pressure fell to 28.28 inches at Cleveland, the lowest ever recorded in Ohio, as the center of the blizzard crossed Ohio. This rapidly intensifying storm pulled bitterly cold air across Ohio on winds of 50 to 70 mph. These conditions, combined with heavy snow and blowing of deep snow already on the ground, caused extreme blizzard conditions all across Ohio. Enormous snowdrifts covered cars and houses, blocked highways and railways, and closed all airports for two days. More than 5,000 members of the Ohio National Guard were called to duty and were pressed into long hours of work with heavy equipment clearing roads, assisting electric utility crews, rescuing stranded persons, and transporting doctors and nurses to hospitals. Forty-five National Guard helicopters flew 2,700 missions across Ohio rescuing thousands of stranded persons, many in dire medical emergencies. Thousands of volunteers with snowmobiles and four-wheel drive vehicles responded to pleas from police statewide to deliver medicine and transport doctors and nurses to hospitals. The death toll of 51 made this one of the deadliest winter storms in Ohio history. Retired meteorologist Bob Alto, 71, of Massillon, recalls arriving at work at 6 a.m. Thursday at the National Weather Service at Akron-Canton Airport. It became his home for the next 58 hours. "Nobody could get in or out," he said. "The roads were closed. So I couldn't be relieved. There were three of us there: myself, Phil Martin and Ed Heath. We rode it out there at the airport." The trapped weathermen witnessed a record-breaking blizzard. The center of the storm was west of the airport. Around the clock, the trio updated forecasts, issued radio warnings and maintained contacts with sheriffs in Summit and Stark Counties. They also had Amateur Radio. Stark County Amateur Radio Operators were also part of the response & relief efforts during the great blizzard. Bill Parks, K8JZN (SK) working with airport weather officials and local radio operators provided support communications between the weather bureau and the Stark Co EOC. Operations took place on several repeaters including the original 146.79 repeater and the 147.12 repeater which was located at Molly Stark Hospital back then. Other communications took place in Summit County on the 146.64 repeater which handled nearly all of the emergency traffic directed into Summit Co. I remember listening to all of the local traffic during the storm on an old Midland 2 meter radio I had picked up. Unfortunately I only had my novice license back then and could only monitor the events unfolding over the three days of the storms duration. That was the start of my interest in emergency communications that has continued through today. 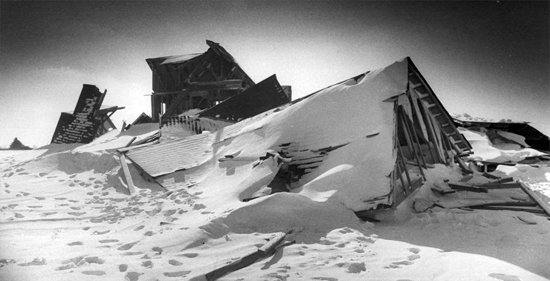 The blizzard helped make January 1978 the snowiest month in Northeast Ohio history. Akron-Canton Airport broke a record with 37.5 inches. Meteorologist Also kept the 1978 barograph charts as souvenirs and later let his grandkids borrow them for school projects. The Blizzard of 1978 was one of the biggest calamities during his 34-year career. "I remember it very clearly," he said. "It was quite an event." (Jan 26, 2007) -- The ARRL Board of Directors accepted the Report of the National Emergency Response Planning Committee (NERPC) when it met January 19-20 in Windsor, CT. 1.) Enhance ARRL and ARES training in basic message handling, including nationwide messaging exercises to "challenge the system" and evaluate speed and accuracy. 2.) Develop a continuing education course covering installation, configuration, and use of Winlink 2000 for email. 3.) Formally establish a national ARES volunteer database for use during major disasters and establish training criteria. 4.) Institute a Major Disaster Emergency Coordinator (MDEC) function to coordinate responses to large-scale national or regional disasters or emergencies. 5.) Become better acquainted with the emergency response needs of distant ARRL sections, such as Pacific, Puerto Rico, Virgin Islands and Alaska. 6.) Improve working relationships with national-level served agencies. 7.) ensure ARRL staff training in the Incident Command System (ICS) and National Incident Management System (NIMS) and, as necessary, adapt ARRL's emergency response structure to the Unified Command model. 8.) Explore the possibility of providing nationally recognized credentials. 9.) Develop a "Swiss Army Knife" electronic publication that provides resources for ARES and National Traffic System volunteers. In addition, ARRL President Joel Harrison, W5ZN, will appoint an ad hoc committee to study issues relating to background investigations as they apply to Amateur Radio volunteers working under League auspices and to recommend a background investigation policy that address both the interest of the ARRL and its volunteers. The Board also okayed establishing the position of Emergency Communications Manager within the newly created "Program s and Services Department. This individual will be responsible for relations with served agencies -- including governmental agencies, memoranda of understanding, administration, ARRL internal emergency response planning, simulated emergency tests (SET's), emergency communications training, the Amateur Radio Emergency Service (ARES) database and related activities. Click Here and Also Here for additional information. (Apr 1, 2007) -- A recent article in our local newspaper discussed the progress that has been made by various Stark County agencies as they continue to prepare for the day when an emergency may strike our area. A committee of Stark County Health Care and Emergency Response Organizations is continuing their plans to bring calm to the chaos that such an emergency would bring. Recently the Stark County Emergency Preparedness Health Care Planning Committee met with local government officials to outline what system is in place should a mass emergency occur. The group includes representatives from Affinity, Aultman, and Mercy Hospitals, as well as the county health departments, law enforcement agencies, emergency response services and nursing homes. They have been planning for disasters since 1999. While not mentioned by name, the Stark County ARES has also been quietly preparing as well. We have been encouraging our local members to increase their emergency response capabilities by making sure their equipment is ready at short notice. We have also encouraged them to take both the ARRL Emergency Communications Certifications Courses and more recently obtain FEMA Certification in the Basic Introduction to Incident Command Systems and NIMS. Mercy Medical Center Committee representative Jack Liberator, no stranger to the capabilities of our local ARES stated in the article that "We have better resources today" and "We start with what we can do on our own with our resources and we go from there." "We don't have all the answers, but we are doing our best to plan." One thing you can be sure of is that Amateur Radio is a strong part of that planning. I am certain that if and when such a situation would strike, the call would go out almost immediately for amateur radio volunteers to fill the gap between what the commercial services would be called upon to provide and the gaps that would be created with services inability to community with each other. Commercial services would be swamped handling crisis situations and Amateur Radio would be called upon to handle the various support functions that would be needed. With that thought in mind, we have been quietly preparing our equipment, manpower and resources to meet that need. Dual band radio's are currently installed in nearly all of Stark counties hospitals as well as several other key locations. By years end I anticipate other Commercial Safety forces and other local government agencies will realize the importance of having amateur equipment installed at their locations. The last three years we have also been establishing a Winlink Emergency Communications System here in Stark County and training operators in it's use. This digital email radio system will permit large amounts of data to be quickly sent from the scene of an emergency to various support agencies providing yet another resource to our community. None of this happens without the commitment of many local amateurs who work tirelessly to install and maintain equipment, obtain the training and certification, and prepare themselves should disaster strike. QST Magazine's April issue includes an excellent editorial from Chief Executive Officer David Sumner, K1ZZ. Titled "Planning for Major Disasters", David notes the steps the League has taken to improve it's response to National Disasters. They have realized weaknesses in their ability as an organization to respond effectively and efficiently to large-scale disasters. ARRL President Joel Harrison, W5ZN and the Board of Directors appointed an Ad-Hoc National Emergency Response Planning Committee (NERPC) to create a comprehensive recommendation for ARRL responses to national, regional, and international disasters. I would encourage everyone to read this editorial. A like to it is currently posted on the home page of this site. Preparing for Disasters is a never ending mission. The real question is - Are We Ready ? (Oct 14, 2006) -- On Thursday, October 12th the Stark County ARES was a featured presenter at the 2006 Ohio Environmental Health Association Northeast District Fall Education Conference. This years Conference was held at Atwood Resort & Conference Center in Delroy, Ohio. The program titled "Amateur Radio Communications in Disasters" was requested by Keith Riley, Assistant Chief, Ohio EPA NE District Office and was presented by Terry Russ - N8ATZ, Assistant EC Stark Co ARES. The presentation included a viewing of the ARRL video "Amateur Radio Today" followed by a PowerPoint presentation that covered Amateur Radio from its early beginnings to today's focus on Emergency Communications. The presentation concluded with a short Q& A session. Approximately 75 attendees viewed the presentation with several asking questions afterward. The OEHA is an organization founded on Education, Emergency Response, Public Outreach, Legislation and Environmental Professionalism and was interested in learning more about Amateur Radio's current role in Disaster Communications. At the conclusion of the presentation Terry was presented with a Certificate of Appreciation from OEHA District Director Keith Riley and Stark County ARES member Jack Wade - N8LCS of the Canton Health Department. (Sep 20, 2006) -- The September 11th edition of the Massillon Independent contained several interesting articles that discuss the changes and improvements that have been made in the five years since the terrorist attacks on the World Trade Center. The first covered the work being done to prepare Stark County for the "next time", and is the responsibility of the Stark County Emergency Management Agency and Director Tim Warstler. The agency has come to the fore front during the last five years as work proceeds to prepare Stark County for a major disaster. While the agency has purchased nearly 3.3 million worth of equipment during that time, millions more could be spent on preparations. Tim noted that "any large scale disaster is going to require outside resources." Amateur Radio is certainly an outside resource Tim was referring to. Disaster planning has also consumed much of the Agency's time. The county has created an Emergency Operations Plan, which provides broad guidelines for coordinating a disaster response. 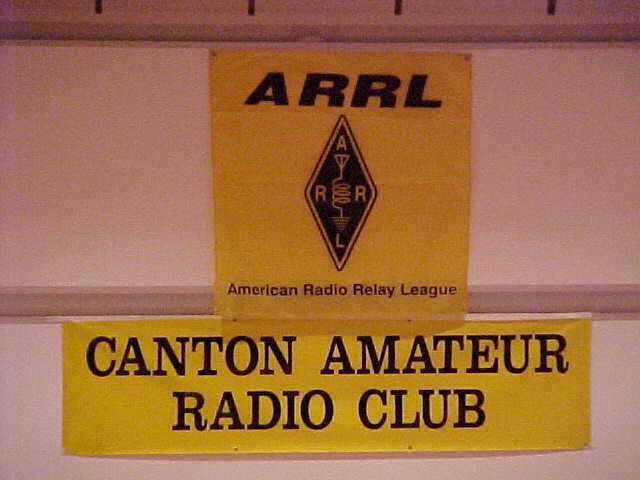 Rest assured that Amateur Radio is an integral part of that plan as has been demonstrated by the recent revamping of the ham radio station currently under the direction of the Canton ARC. A fully operational Winlink station along with formal training in the operation of the county radio equipment are all part of the future plans to a local disaster response. The next article centered around area hospital's efforts to prepare for the worst case scenario, a bio-terror attack. Working in conjunction with the Stark County Health Department, hospitals have formulated bio-terrorism response plans, and they have worked much closer with local fire departments, law enforcement agencies and area hospitals. They have also been ramping up their communications and planning. Amateur Radio will play an important part of this response as well. Over the past several years, amateur radio equipment has been installed in all Stark County hospitals thanks to the HRSA grants. Currently plans are underway to add digital communications using the Winlink Emergency Communications Systems. Jackson Township Fire Chief Ted Heck also commented on the changes put in place by nearly all of Stark Counties Safety Forces as they also prepare for the future threats we may face. Several local agencies have been trained in the National Incident Management Systems (NIMS), which standardized communications terminology and command structure protocols. Amateur Radio operators must also become familiar with these protocols if we are to be an effective part of disaster communications planning. "Part of the problem is we still can't communicate effectively", said Chief Heck, "we've made major strides but they're not adequate enough to make us respond on a large scale". The current ARRL catch phrase is "When All Else Fails ... Amateur Radio". This phrase may very well become the last line of communications during a local disaster. The real question is .... Are We Ready ? (Mar 30, 2006) -- A Multi-County Coalition meeting was held last Sunday, March 26th at Tuscora Park in New Philadelphia with several Stark County ARES members attending including Assistant EC Terry Russ - N8ATZ who along with Winlink Technical Director Ralph Bugg - K8HSQ presented a slide presentation on our Stark County Winlink Communications Initiative. The meeting included nearly 30 attendees representing about seven southeastern counties as well as several ARES Emergency Coordinators, Assistant EC's and District Coordinators. Additional Stark ARES members in attendance included Net Manager Dale Storey - KB8LWP and Net Coordinator Michelle Gill - KC8ZEJ. Club representatives reported on their current activities and ARES coordinators also reported on their current public service activities. Discussions also involved the need for ARES volunteers to become familiar with FEMA's Incident Command System training courses. Most important were ICS-100, ICS-200, ICS-700 and ICS-800. After a short break Stark County Winlink Coordinators gave a slide presentation on our Stark County Winlink Initiative. The meeting was well attended with a lot of information shared with all attendees. The next Multi-County Coalition Meeting is scheduled to be held on Sunday, July 23rd at 2:00 PM in Coshocton. (Jan 24, 2005) -- Mercy Medical Center, home to the Stark County ARES Repeater recently completed the installation of several Yeasu Dualband radio's as part of the HRSA project. Installed as part of the Homeland Security initiative, the station equipment was provided by the Federal Dept of Health & Human Service project, which involves installing amateur radio equipment at hospitals throughout Ohio and beyond. The equipment will be used to provide communications support during both drills and emergency situations. With assistance from Stark Co ARES Coordinator Dave Beltz, WD8AYE, one station was installed in the Emergency Department Security office while the second is in the hospital's Conference Room C which acts as a command center during hospital emergencies. Work is also currently underway to install equipment at both Massillon Community and Doctors Hospital. Pictured below are some pictures of the equipment installation. The equipment is housed behind this locked cabinet to prevent unauthorized use. The Future Role of the ARES ? (Feb 20, 2005) -- As part of our Stark County Winlink 2000 Emergency Communications Initiative, I participate in several email reflectors. These reflectors are intended to provide a common area or thread that allows participants to exchange ideas, opinions, and sometimes just plain rants regarding the reflector’s theme. One recent item has created quite a stir among reflector participants and involves requiring background checks for volunteers in the Amateur Radio Emergency Service (ARES) and RACES programs. The ARRL requires no specific qualifications to participate in the ARES other than a valid radio license and a willingness to help. Local County Emergency Coordinators are responsible for registering volunteers and look for certain characteristics. Strong discipline, responsibility and professionalism are a few of the traits we look for in our volunteers. Since the post 911 era, the role all volunteers play has dramatically changed. Public safety forces are more cautious of the nature of their jobs and the volunteers who assist them. This impact has already been felt in larger cities where ARES volunteers are being required to submit to basic background checks, especially those who assist with federal government agencies and military installations. One participant on the Winlink reflector has an active ARES program in Pennsylvania that is part of a Nuclear Power Plant first response team and regularly participates in their emergency drills. All of their radio volunteers have undergone background checks which seems appropriate considering the high security area’s they have access to. While the background checks issue seems to center around RACES programs, it has also found its way into the ARES. Currently Stark County has no formal RACES members or active programs. Our contingent of active ARES volunteers has for years provided the necessary communications support requested by our local County Emergency Management agency and the other served agencies we help. We have been able to supply this assistance without requiring any professional background information. Our ARES registration application requires only basic contact information, name, address, telephone numbers, etc. License class, equipment capability and current training levels are pretty much it. Only Dave Beltz and I have access to this data and it is not shared with any other agencies. It’s important that we know how to contact you in an emergency and what capabilities you have that we may need in an emergency. I can understand the need for additional background information. During an ARES drill some years ago for example, I was requested to drive a county owned vehicle when it was discovered that they didn’t have enough drivers at the scene. Fortunately I had provided communications assistance to this agency before and they were comfortable handing me the keys. After the exercise during the critique it was noted that I drove a county vehicle without securing the proper authorization. A small item it seemed, but what if I had been involved in an accident? What if I didn’t even have a valid driver’s license? A mishap during a drill or actual emergency could cause irreparable damage to our mission and prevent us from rendering any assistance in the future. Currently none of our members are required to have any background security checks to be members of the Stark Co ARES or participate in drills or events. None of our served agencies has ever requested anything of the sort. I would hope that I could personally vouch for every volunteer on our roster but the reality of the times we now live in may one day force us to operate with a higher level of concern. Background Check Clearance could one day be necessary to volunteer for certain assignments. While we do not have any high security facilities nearby, we do have an airport that includes a military National Guard Air Wing detachment. I would ask every member of our ARES service to consider the possibility of one day being requested to submit to a basic background check. Could you do this in good faith and remain an active volunteer? I anticipate that should this day come we would have to establish another layer to the ARES structure. Those who have obtained this clearance and those who have not. It has worked successfully in other ARES programs across the country and I’m sure it would work here. Time will tell. 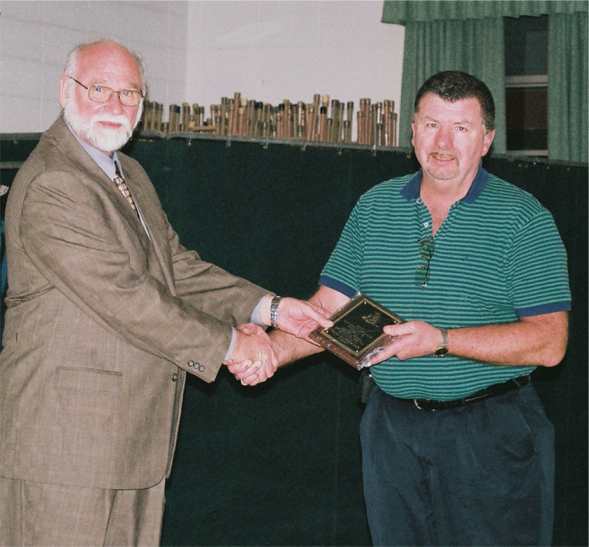 (Jan 12, 2004) -- Stark County Emergency Coordinator Dave Beltz, WD8AYE was presented with a Special Achievement Award recognizing his 25 years of service to the greater Stark County area. The award was presented at the Massillon Amateur Radio Club's annual awards banquet on Saturday, January 8th. 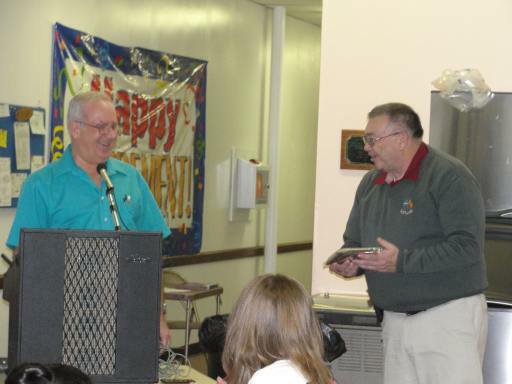 Terry Russ, N8ATZ - Assistant EC presented the award on behalf of the Massillon ARC. Since Dave's appointment to EC in 1976, he has helped radio operators earn the respect and admiration of many local community leaders and public safety forces. Amateurs have earned a key role in emergency planning and disaster preparedness in our community thanks to Dave's leadership. The award was presented in appreciation of Dave's hard work and dedication. Since taking on this responsibility Dave has established a strong and skilled ARES membership, oversees a county wide Skywarn Spotter program and successfully negotiated the installation of a wide area emergency communications system at Mercy Medical Center with their promise of continued support. Congratulations Dave on this well earned recognition ! 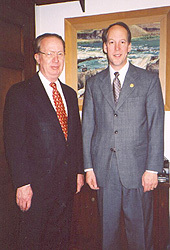 (Feb 1, 2005) -- President George W. Bush has presented the President's Volunteer Service Award to Thomas J. "T. J." Powell, N8UIR, of Northfield, Ohio. Powell, 38, is an active volunteer with the Northeast Ohio Medical Reserve Corps (NEOMRC), a partner program of Citizen Corps. The president has called on all Americans to volunteer two years or 4000 hours over the course of their lifetimes, and he created USA Freedom Corps to help foster a culture of service, citizenship, and responsibility. Since March 2002, President Bush has met with more than 400 individuals around the country who, like Powell, have answered the call to volunteer service. NEOMRC provides medical support services for public events and emergency situations. As chief of NEOMRC and a certified emergency medical technician, Powell volunteers 800 to 1000 hours per year, helping with logistics, planning, Amateur Radio operations and first-aid for charitable fundraising events throughout Northeast Ohio. In addition, he assists local fire departments and emergency medical service agencies during incidents that impact public health. President Bush made the presentation during a January 27 visit to Cleveland. (Nov 12, 2004) -- Don Wade, W8DEA just returned from the Florida Panhandle last week after spending nearly an entire month, from September 26 until October 16, helping the FEMA agency in the wake of the worst Florida hurricane season in quite a few years. Don joined other fellow FEMA agents in the counties of Escambia and Santa Rosa , two of the hardest hit counties in the Florida panhandle. Don, a Field Supervisor for FEMA was assigned the area of Santa Rosa .. Don was in charge of five FEMA teams that consisted of 10 to 12 people each. 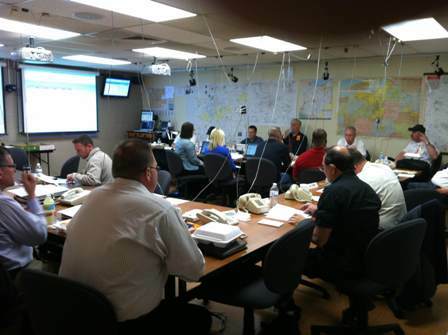 The State of Florida sent in SERT Teams( State Emergency Response Teams) that was assigned to Don and his Teams. The State of Florida also sent in teams from the Department of Transportation and Department of Human Resources that were assigned to work for Don. There (FEMA) jobs were to assess the damage to property and help the citizens in any way they could. The Teams were made up of people from all over the United States and were of all ages. From Alaska , Idaho , Ohio Michigan but most were from out West, Texas , etc. A typical day for Don began around 4 30 AM , he would arise and begin to work. He would do all his own planning and operations on a daily basis get up and make changes depending on personnel that was available. Don would like to be on the road by 6:00 AM and call his team leaders and make sure all the personnel were on the road. Travel time was about two to two and a half hours, depending on where they were assigned that day, mainly because there were no rooms closer. Their days would usually last from 10 to 12 hours a day. Then they would have to drive back. Most of the work was to assess damage and community relations. Many times they were the first officials the storm victims would see. They would listen to their stories and offer their help such as what Don called Special operations that was to make sure they had Food, Water, and Shelter either from the government or the Red Cross, or other agencies working in the area. Don and his teams would fill out a report on the victims and submit this report to FEMA, this started the process of recovery for the victim. They(victim) could call FEMA 1-800 number and start the report in which Don’s teams would receive and follow up to verify its validity. The picture above is typical of what Don and his teams encountered every day. They would have to assess the damage, verify and contact the owners of the home and then start the process of making reports the homeowner could receive assistance to repair the damage. The homeowner in this type of damage could be facing up to a year to 18 months before his home is completely repaired. Some of the special problems that they ran into was that a lot of the people they helped could not speak English, so the reports and other paper work was made out in Spanish, Japanese, and Vietnamese. Since each team was given a vehicle to travel to their destinations, they were responsible for their own food , water and gasoline. Travel sometimes was nearly impossible since there was so much debris in the roads, not to mention that half of the roads were covered with sand, that had to be bulldozed away. in the picture below, you can see some of the debris that was “just bulldozed to the edge of the street & left for the clean up crews to remove.” In the background is a hotel that was damaged by a wave surge that hit the hotel at the 60 foot mark (that’s five stories up!) and did extensive damage to the hotel. As you can see, much of the roadways are still covered with sand and will be probably up to November 1. Semi truck after semi truck were loaded with debris and hauled away to a landfill that was especially created to handle the storm debris. Restoring utilities as can be imagined were a monumental task. Power crews from all over the United States were sent to the storm damaged regions to help with the rebuilding. Crews from Ohio Power, Ohio Edison and others from Ohio also helped with the rebuilding. Some areas are still without power, but soon will have them restored. Don personally seen Ohio Edison crews in his area. Although much of the utilities were extensively damaged, most are up and running a month after the storm hit. Gasoline and food supplies have been restored, in fact a lot of the fast food restaurants were the first to reopen, however they were limited because many of their employees had a hard time just getting to work and a lot of them had to leave the area because their homes were destroyed. Total restoration could possible take years to complete, some will never be the same. After the initial meeting with homeowner the teams handed out a flyer and made sure they registered, the process was mostly up to the homeowner to contact FEMA, give them his name, address (if anything was left or where he could be reached) and his social security number. Once they were in the system a FEMA inspector would come make contact with them and check out their residence to determine the extent of damage and what their long term needs were. Don was in Florida during Hurricane Ivan and tropical storm Mathew. A lot of his work became frustrating because of the extensive damage and the limited supplies and manpower that was available. A lot of the victims were living in tents, or any other shelter they could find. Some even moved in with complete strangers, just to have a roof over their heads. Those who helped were wonderful people to let them into their homes and tried to help in a time of need. After a period of time they found the system wasn’t moving fast enough. People had to qualify before FEMA could bring in trailers for temporary housing. They had to fill out paper work and this took time, which made their work even more frustrating. Don’s future plans with FEMA are right now quite up in the air. He has to go back to Florida for one more month and if the opportunity arises, he might take on a full time job with FEMA. He is currently awaiting the decision of his superior before he can make the “ultimate” decision. He would be permitted to stay in this area and if the need arises, he would travel to the next “hot spot” He says that anyone can work for FEMA, it requires a two week training in the Field (just like Don did) and then a supervisor’s job would be offered. If you are interested, log onto FEMA’S web site and follow the selections there for opportunities. Don's "going away” party during the last few days he spent in Florida . If nothing else he will have some fond memories and a very satisfied feeling of being able to help people in their time of need. Eh!... Hey Don I see there was no shortage of pizza & pop! 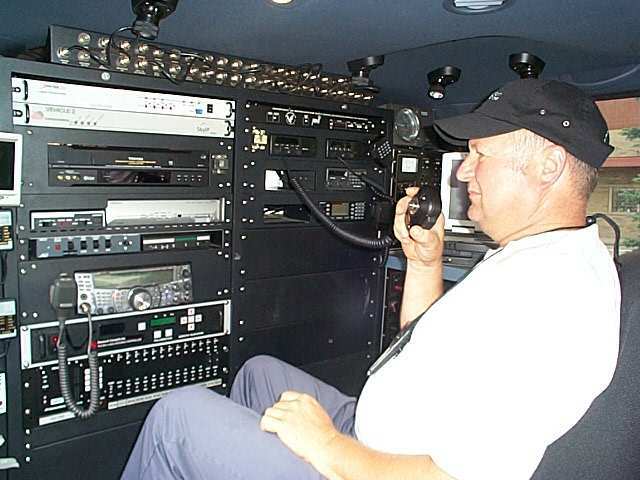 (Oct 8, 2004) -- Alliance Amateur Radio Club ARES liaison Don Whitaker - K8OMO reports that the new Homeland Security amateur radio station has been installed at Alliance Community Hospital (ACH) and is fully operational. Don and Jim McGeehen, Director of Protective Services for ACH were recently interviewed by the Alliance Review regarding the new installation. Installed as part of the Homeland Security initiative, the station equipment was provided by the Dept of Health & Human Services HRSA project, which involves installing amateur radio equipment at hospitals throughout Ohio and beyond. The station will be used to provide communications support during both drills and emergency situations. Members of the AARC have volunteered to activate the station each Tuesday evening in conjunction with the Stark Co ARES Net. The newspaper article noted that the station will provide point to point communications in the event of an area wide emergency that could disrupt other normal communications channels and that members of the AARC would be ready to staff the station when necessary. Congratulations to the Alliance Amateur Radio Club for their continuing support of ARES and their local community. (May 2, 2004) -- On Saturday, April 24th Stark County EC David Beltz - WD8AYE and AEC Terry Russ - N8ATZ attended the 2004 State ARES Meeting in Columbus held this year at the Ohio Emergency Management Agency. The meeting drew nearly 100 participants representing local ARES groups from over 40 of Ohio's 88 counties. This meeting also marked the introduction of new Section Emergency Coordinator John Chapman - WB8INY. After opening the meeting with a round of introductions, John laid out this year's meeting agenda. Major topics covered the upcoming Dayton Hamvention ARES Program, current hospital communications programs and initiatives, including HRSA, the Digital National Traffic System program, the Ohio Citizens Corps and updates on local ARES programs throughout Ohio. A central topic of this years meeting was an update on HRSA. HRSA stands for Hospital Resource and Services Administration which is part of the U.S. Dept of Health and Human Services. As part of this initiative, hospitals across the country are being provided with funding for the sole purpose of establishing fully operational amateur radio stations for use in both healthcare facilities and field sites to ensure adequate communications during emergencies. The program is just now gaining momentum and we are in the very early stages of initiating this program here in Stark county. This will not be anything knew to many of our area hospitals as they have previously recognized the importance of installing either antenna or complete stations for some time. Our own Mercy Medical Center spearheaded this commitment having been the home of the 147.12 ARES Repeater for many years. AS the program develops we will bring you additional details. 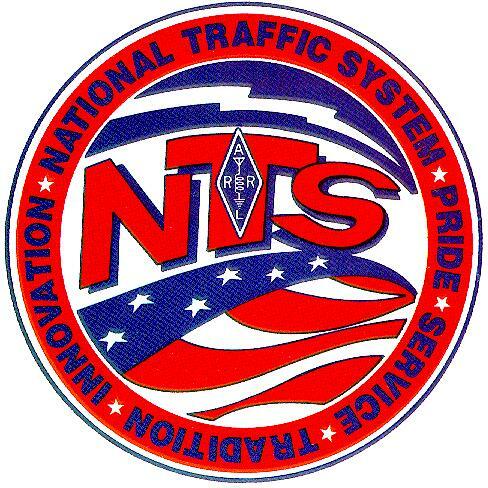 The future of the National Traffic System (NTS) was also discussed during the meeting. During the last year in partnership with Homeland Security the ARRL Board of Directors looked for an enhancement to the existing NTS that provided for a global digital email network. A system called Winlink 2000 is an existing amateur radio digital network that has been in use for over five years. The system can accomodate hundreds of thousands of emails, more than all the NTS and MARS traffic transfers combined. It does this over Amateur Radio with an average response time of less than 1.8 minutes with nearly 100% accuracy. The use of such a system is to provide a digital emergency communications network to provide local disaster communications between served agencies. The system can remain operational even if commercial systems are overloaded or completely fail. The philosophy behind the Winlink 2000 effort is simply that standard email has been universally adopted, and is used for most digital communications where detail and deployment of complex timely written material is necessary. It is the perfect compliment to existing voice network capabilities now deployed by the ARRL Field Organizations. The last major topic at this years meeting was a short presentation of the Ohio Citizens Corps, a component of President Bush's Freedom Corps initiative. The Citizens Crops programs include many local programs such as the Community Emergency Response Team (CERT) program which is gaining interest among county Emergency Management Agencies. It is anticipated that Amateur Radio will play a pivitol role in the establishment of these local working groups in the near future as amateurs continue their commitment to service with the Department of Homeland Security. It starts with the formation of a County Citizens Corps Council, something not yet organized here in Stark county. Our new Emergency Preparadness Agency Director Rick Alatorre does have plans for this new citizens group and when such a council is formed, we hope to have amateur radio representation. 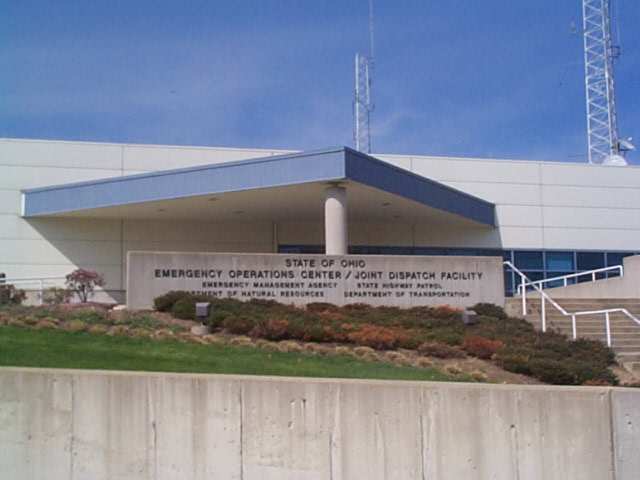 The meeting concluded with a short tour of the Ohio EMA facility which included a demonstration of its vast state communications command center. (Oct 6, 2005) -- Red Cross member Paul Burke - KB8VAS, our longstanding Skywarn Coordinator spends more time out of town these day's than most of us ever will all our lives. Recently I caught up with Paul's wife Ruby - KC8AWU who indicated Paul has been very bust this year handling Red Cross emergencies. A full time National Red Cross Disaster Coordinator, Paul has been kept very busy coordinating the National Response to numerous disasters around the country this year. His most recent responsibility has again been coordinating the National Response to both Hurricanes Katrina and Rita. Operating out of the Disaster Operations Center (DOC) in Falls Church, Virginia, the nerve center of the Red Cross Disaster Services, Paul has been putting in very long hours each day coordinating relief and communications efforts throughout all Red Cross operations in the south. The DOC is open 24/7/365 ready to respond to an emergency wherever necessary. More than 177,600 Red Cross workers from all 50 states have responded to this disaster including several from the Stark County Chapter. 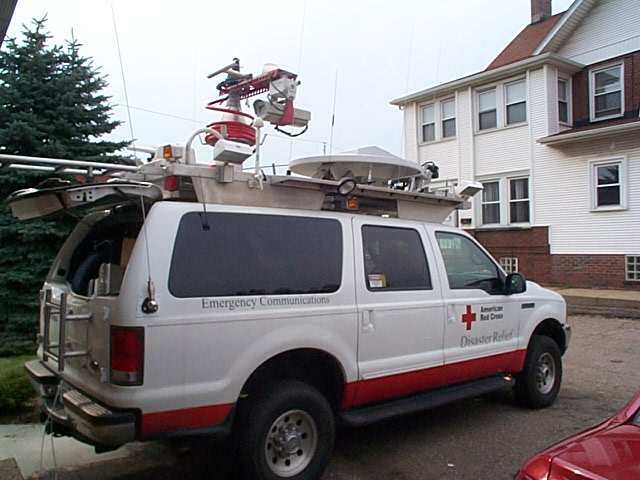 Paul was very active coordinating Red Cross National operations during May of 2002 as a tornado hit part of Jackson Township destroying several homes and damaging dozens of area houses and the severe flooding during August 2003 that involved several shelters to be opened and Amateur Radio efforts for nearly a full week. Ruby hopes Paul will be able to come home soon at least for a log overdue rest provided Mother Nature cooperates ! (Oct 5, 2005) -- The Amateur Radio community has continued to respond to calls for volunteers to support communication for served agencies in areas affected by Hurricane Katrina and Hurricane Rita. Louisiana Section Emergency Coordinator Gary Stratton, K5GLS, says about 45 Amateur Radio volunteers are still on hurricane relief and recovery duty there. Volunteers initially thought to be needed for a FEMA operation in Louisiana were redirected to South Texas, however. (Sep 16, 2005) -- UPDATE! Amateur Radio is continuing to earn praise and respect as the Hurricane Katrina relief effort moves forward. Amateur Radio equipment and supplies arriving at the American Red Cross Hurricane Katrina relief staging area in Montgomery, Alabama, have been turned around as quickly as possible to accompany volunteers into the field. A team headed by Alabama ARRL Section Manager Greg Sarratt, W4OZK, now has been on duty for some three weeks, overseeing Amateur Radio volunteer intake and registration and trying to satisfy the ever-changing requirements of the Red Cross and other served agencies. Equipment started showing up last weekend. (Sep 14, 2005) -- The ARRL ARES E-Letter Special Edition dated September 11, 2005 is focused on the Hurricane Katrina continued amateur radio response in Texas, Louisiana, Mississippi and Alabama. North Texas ARES has primarily been supporting the West Gulf ARES Emergency Net dealing with Health & Welfare traffic, and supporting Red Cross, Salvation Army and FEMA operations. South Texas ARES has operations supporting seven Red Cross facilities that include distribution centers and shelters. Over 35 operators have provided over 1,200 volunteer hours thus far as the operation continues. Amateurs were requested by the county EMA to provide four operators 24 hours per day on site at the Houston Astrodome with two additional at the EOC office totaling over 720 volunteers so far. Alabama - The state capitol of Montgomery was the scene of processing and orienting volunteers for Red Cross and other duty in Louisiana and Mississippi. Alabama Section Manager Greg Sarratt - W4OZK has been coordinating the volunteer effort as well as provide the staging area for the generous donations of ham radio equipment being delivered for use in the relief effort. New Orleans reports that amateur radio operators are beginning to be sent into areas around New Orleans to support command and control operations for Red Cross and other disaster relief operations. Amateur Radio has been the only means for state officials at the State EOC in Baton Rouge to communicate earlier this week with areas above Lake Pontchartrain. Also, there was a communication to the EOC from FEMA that said, "Ham Radio is our prime communications with you, and they should get anything they need." Digital communications including the new Winlink 2000 communications system is currently being used as outlets for Health & Welfare traffic into numerous areas in both Louisiana and Mississippi. To date more than 1,000 amateur radio operators are involved in relief efforts in the affected areas noted above. You can read the complete ARRL ARES E-Letter by clicking here. (Sep 8, 2005) -- Amateur Radio operators from states along the Gulf Coast and elsewhere in the US continue to volunteer their skills and expertise as the Hurricane Katrina relief effort heads into its third week. ARRL Section Managers (SMs) and Section Emergency Coordinators (SECs) across and around the affected region have been teleconferencing daily to keep their efforts on the same page. 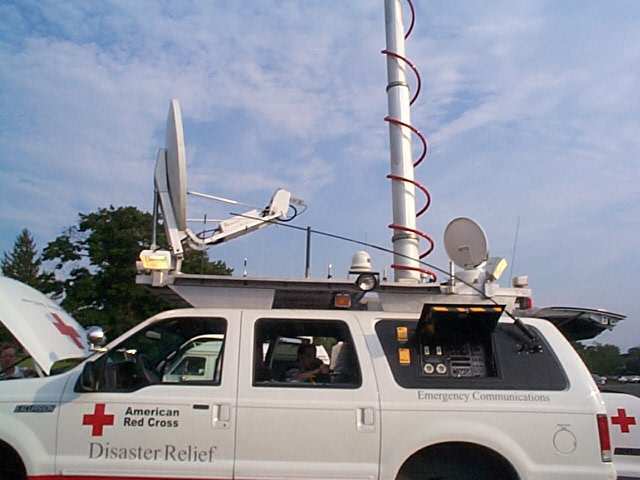 In the field, Amateur Radio Emergency Service (ARES) and other volunteers are assisting as needed to support communication for relief agencies as well as for state and local government and even the Federal Emergency Management Agency (FEMA). Louisiana SEC Gary Stratton, K5GLS, reports that earlier this week Amateur Radio was the only means for state officials at the state emergency operations center (EOC) in Baton Rouge to communicate with the so-called "Florida parishes" above Lake Pontchartrain. (Sep 2, 2005) -- UPDATE -- The ARRL now is seeking experienced Amateur Radio emergency volunteers to help supplement communication for American Red Cross feeding and sheltering operations in Mississippi, Alabama and the Florida Panhandle--as many as 200 locations in all. Special consideration will be given to operators who have successfully completed the ARRL Amateur Radio Emergency Communications course training (Level I minimum) to serve as team leaders. These volunteer operators will help to provide communication and equipment for relief efforts in the aftermath of Hurricane Katrina. Volunteers may face hardship conditions without the usual amenities and will need to provide their own transportation to the marshaling area. Working in cooperation with the ARRL, http://katrina.ab2m.net/ will now be handling all volunteer sign ups for the Katrina Relief effort. If you have already entered your information to Katrina@arrl.org, your information will be forwarded to AB2M to avoid duplication. Katrina@arrl.org should be used for all other inquiries to the ARRL regarding Hurricane Katrina. (Sep 2, 2005) -- I am posting an important update on the ongoing and expanding work our headquarters staff is doing to plan and arrange many aspects of the management and relief efforts in the aftermath of Hurricane Katrina. I recently spoke with ARRL President Jim Haynie, W5JBP only minutes after one of the HF disaster relief nets secured for the day on Wednesday. He, along with FCC enforcement officer Riley Hollingsworth, K4ZDH and many additional hams had been working on this net for hours. Jodi Morin, Maty Weinberg, Norm Fusaro and Dennis Otschenbacher have joined the Katrina SWAT Team. They meet daily to coordinate activities. Jodi, Maty and Norm will coordinate all donations of and requests for equipment. We have had some requests already and we need a more coordinated process. Team members are working on a more formal process to accept cash and equipment donations. Chuck Skolaut is working with Riley Hollingsworth to coordinate enforcement and interference issues related to Katrina nets. The ARRL is initiating some higher level contacts with the served agencies. News and Public Relations will be managed as follows: Rick Lindquist -- News stories, Allen Pitts -- Media and PR queries, Steve Ewald and Chuck Skoulat -- Logistics and Operational queries. The League is working on an expanded Katrina web page to be ready early next week. A special edition of the EmComm newsletter will be sent next week. FCC Chairman Martin has asked if we need anything from the FCC. Alan Pitts spoke with the following media contacts: Interview on WTIC AM 1080 in Hartford, The Wall Street Journal, The Washington Post, WVIT, TV - 30 in Hartford, Channel 5 in Nashville, Channel 5 in Boston, Los Angeles AM Radio, British Television in addition to several radio and newspaper reporters around the country. Winlink is taking our W1AW Bulletins and distributing them via their networks. We have added the live audio stream from the West Gulf ARES Emergency Net which is handling emergency amateur radio traffic for areas hit by Hurricane Katrina to the ARRL Website. Go to http://www.arrl.org:8000/listen.pls You will need some type of windows media player to hear the net. A new vehicle, designed especially for the American Red Cross to eliminate communications problems that have plagued disaster relief efforts in the past is currently in service around the country. Once it has arrived and is all hooked up, a local disaster operations center can have up to 48 phone lines, high-speed internet access, e-mail and satellite-enabled communications with national headquarters - all during a time when conventional phone and cellular calls are either knocked out, hopelessly overloaded or simply not available. During Stark counties flood disaster, providing relief efforts began almost as soon as the rain ended. Amateur Radio responded almost immediately to assist Red Cross efforts in the reaction stage of the disaster. 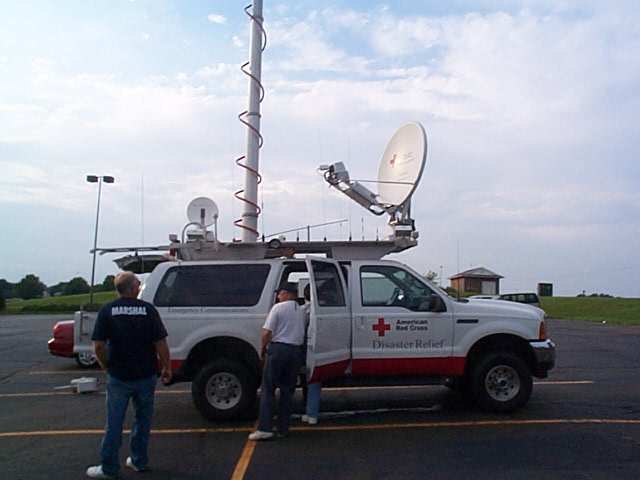 Providing Shelter Communications as well as maintaining a communications link to chapter headquarters, key public official shadowing and roaming ERV vehicles are all part of our immediate response efforts and will always play a critical role in Red Cross Disaster Operations. As the intensity of the relief operations grew to massive proportions, Canton Red Cross Communications Chairman Paul Burke - KB8VAS called for additional assistance. When the Emergency Response Vehicle arrived in Canton, it immediately set-up shop at the temporary relief center that had been established across from the Canton Red Cross chapter headquarters. Operations continued there until Sunday, August 3rd when members of the Stark County ARES assisted in the relocation of the relief center to the First Christian Church where it would be again set-up to handle relief operations for the following week. This vehicle is every ham operator and ARES organizations dream. It is completely stocked with the latest in communications equipment that can literally communicate with anyone almost anywhere - from DC to light as we hams say !. Add to this an extensive computer networking system, a 50 foot pneumatic mast with closed circuit TV, satellite capability and lots more great stuff. Under the direction of Paul - KB8VAS, area amateurs were given an opportunity to examine, explore and operate some of this vehicle's extensive equipment during the move to First Christian Church. We also had the opportunity to take several pictures of the ERV during our demo. A few are posted below. The exterior view. 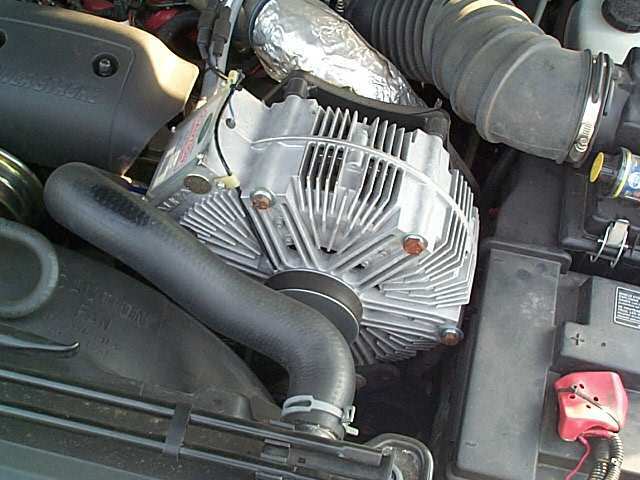 Built on a Ford Excursion chassis, this is one packed SUV ! The main operations console with Jim - WA8GXM at the controls. The main console. Left to Right is wind speed and closed circuit TV, video recording equipment as well as a Kenwood 2000 for HF operations. To the right is multiple VHF communications radios. 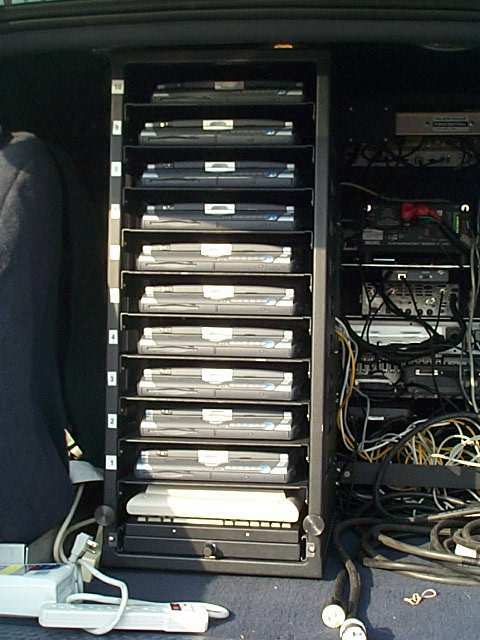 A bank of 10 computers plus full server capabilities is positioned in the rear. Full Satellite Communications, a 50 foot pneumatic mast plus several antenna's occupy the top custom rail assembly. The small dish on the right allows real time weather radar. 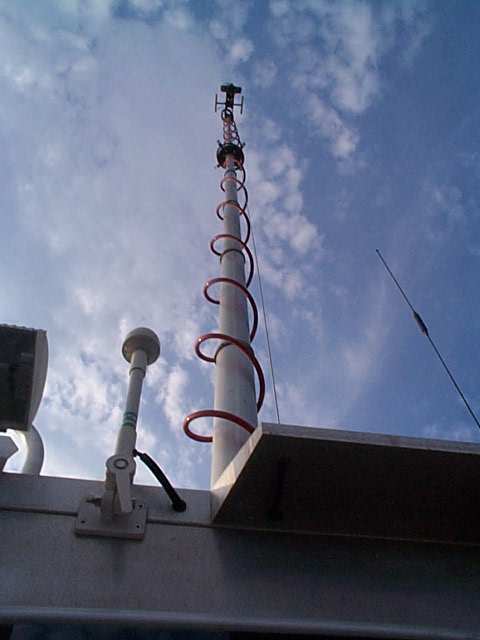 The mast currently supports a remote closed circuit TV camera but also has a rotating top for additional directional antennas. 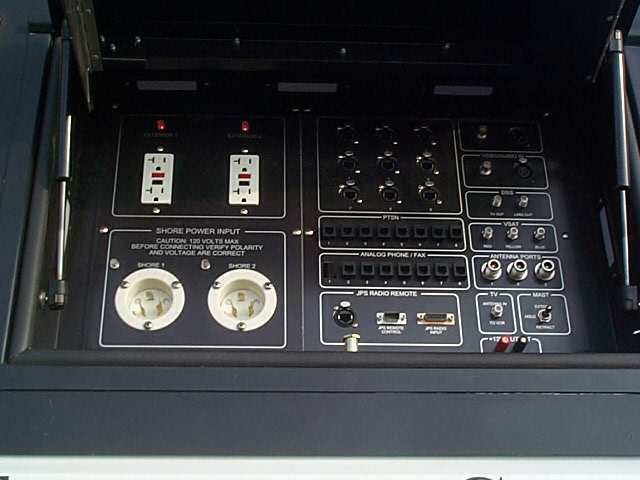 The patch panel allows the vehicle to draw from external power as well as controls for the mast, computer & satellite inputs, antennas and additional inputs & outputs. An on-board 5,000 generator supplies plenty of power for all the on-board systems. 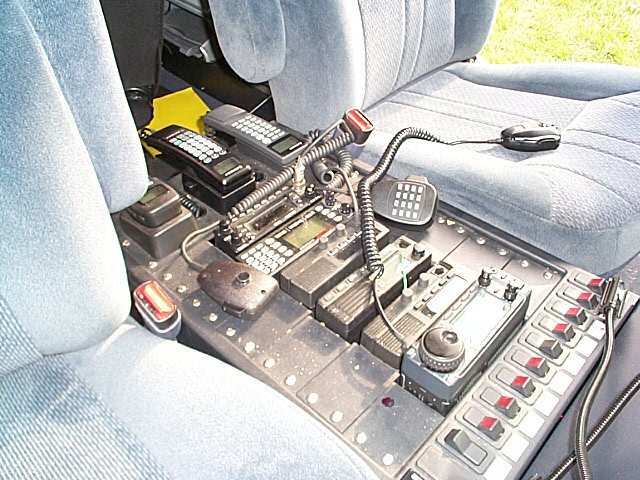 The center console has a full complement of communications equipment, both commercial and amateur. The amateur rig is an Icom IC - 706. Equipment is up and ready for full service at a relief center or any disaster scene. (Jan 24, 2003) -- The January issue of CQ Magazine has a great cover shot. It shows a member of the Sarasota Emergency Radio Club using ATV during a disaster drill captioned by the words "Ham TV: Emergency Tool." The article notes that in times of emergency, often a ham can go to a particular location to radio back to the command post or emergency operations center what he or she is seeing. This could lead to interpretation by the persons on the scene, the radio operator receiving the information, and then the message being sent to a key official. If there is a lot going on at the scene, it may take the ham a long time to describe what is happening. The article goes on to site some examples in which ATV could clarify and enhance a particular situation, applications for both Fast Scan & Slow Scan TV and an excellent short story covering the use of ATV during a HAZMAT drill. I would highly recommend this issue for anyone interested in this facet of emergency communications. Here in Stark County we are also very interested in pursuing this aspect of emergency communications. It would be a valuable tool to add to our arsenal of communications technology. Several members of the Massillon Amateur Radio Club have been experimenting with ATV and are seriously planning to construct an ATV repeater sometime later this year. A transmit beacon is currently operating on 426.25 Mhz to test propagation and coverage patterns. Their ultimate goal is to have coverage throughout Stark County which would serve the local ARES activities very well. They have already successfully utilized ATV during a public service event last fall. During the CROP Walk a simple ATV transmitter was setup to monitor a busy cross street that was along the course. The signal was sent back to the club's Emergency Communications Trailer where it could be constantly monitored during the event. Not only was it very convenient as the day was a little cold, it is almost like another operator on the scene. Their trailer currently has twin ATV monitors installed as well as two low power transmitters ready for use. Ultimately they hope to be able to send a usable ATV picture from anywhere in the county back to the Emergency Operations Center either using direct transmission or relayed by a repeater. A number of technical issues have to be resolved as well as the installation of a receiving station at the EOC. These are a highly motivated group of ATV operators and it is high on their list to complete. 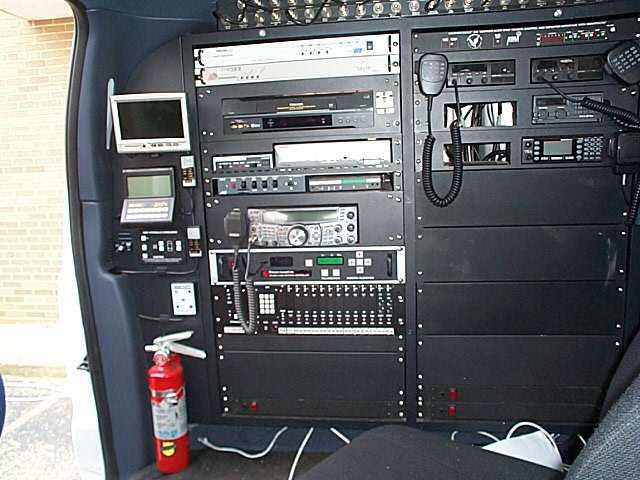 Amateur Television has been successfully used for many years at the New Years Day Rose Bowl Tournament of Roses Parade where it has fully demonstrated its value to emergency communications. It represents the next stage in public service communications and one we hope to take full advantage of in the near future. Newer ATV equipment is small and very portable making setup and power requirements fairly easy. Public Service in the future is about to take on a whole new dimension - ATV. Better make sure you have on a clean shirt and have you hair combed ! Mike Robinson then introduced the keynote speaker for the evening, Ohio Section Manager Joe Philips - K8QOE. Joe's topic for the evening was "The Future Of Amateur Radio". 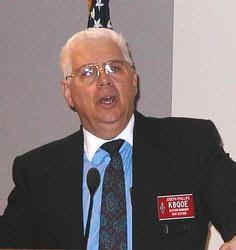 Joe stated that Amateur Radio had experienced a period of "negative growth" during the 1990's, for various reasons and that he believes that since the Y2K concerns, our hobby has received a much needed "jump start" as numerous public service agencies began to investigate alternate means to maintain communications. Then in September of last year, the hobby was once again called upon to help establish order after the chaos of 911. Joe believes that the development of "Homeland Security" will once again bring our hobby back to the forefront of the communications world. This will no doubt bring about the resurgence we have been looking for, bringing many new hams to our hobby. It's still a passion, and its back stronger than ever. The meeting concluded about 9:00 PM with several drawings and refreshments being served. Mr. Marvin Secrest of M & K Engraving was also in attendance providing name badges and accessories to those present. ARES also registered 25 hams, well on our way to re-registering a new corps of ARES registered volunteers. The overall success of the multiclub meeting prompted organizers to consider making this an annual event. A special thank you to the following clubs for attending this years event, The Alliance ARC, The Massillon ARC, QCWA Chapter 21, The Tusco ARC, The Canton ARC and the Pioneer Amateur Radio Fellowship.